Stand strong with the Island Guardians! Stand ready with the strange and fearsome Pokémon of Alola! 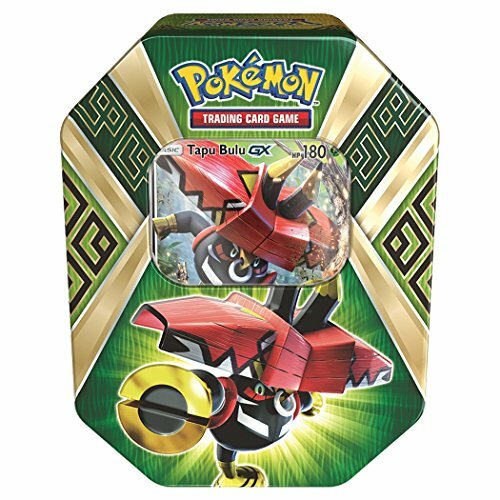 Choose the relentless vines of Tapu Bulu-Gx in the Pokémon Trading Card Game: Island Guardian Tin. Each of these beautiful tins contains all the astonishing power of a strange and mysterious Pokémon-GX who stands as a defender of the land!. BECOME THE GREATEST TRAINER: Will you find Alolan Ninetales-GX, Tapu Lele-GX, Lycanroc-GX, Metagross-GX, Sylveon-GX, Kommo-o-GX, or Hala Trainer? Gotta catch them all: the Pokémon sun & Moon Guardians rising expansion brings over 140 brand new cards to collect. Will you find them all? View More In Decks & Sets. Yugioh Emperor Of Darkness EOD English Structure Deck - 42 cards!